The Underground Tour, created by Bill Speidel in 1965, is no staged production. 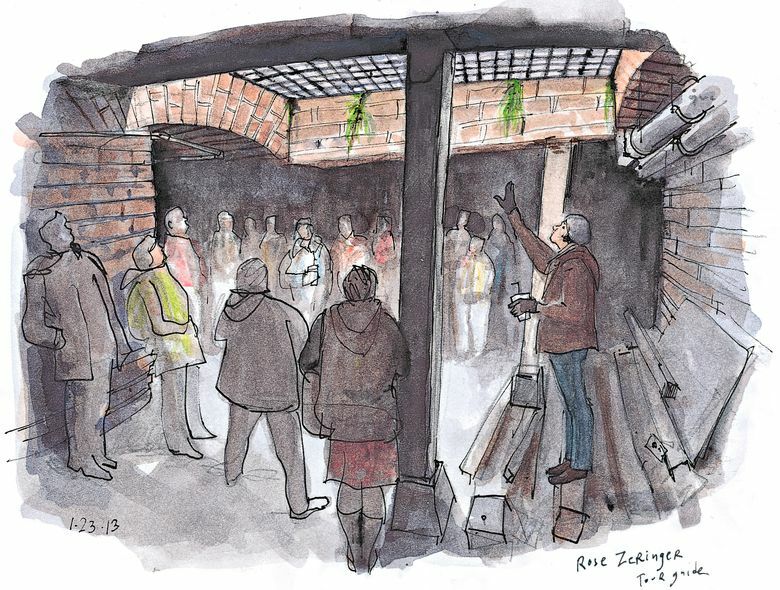 You get to walk through the subterranean sidewalks and building spaces left behind when the city raised the street levels of downtown Seattle during the Great Fire rebuild of the 1890s. I used to dismiss this Pioneer Square attraction as a tourist trap, but a visit proved me wrong. The experience is both educational and thrilling. Sketching along the dimly lit corridors, I felt like an old-time newspaper artist at work in the years before photography — I actually took the tour twice to pencil enough detail into my drawings to be able to complete them later from memory. Since it was a weekday in January, the tours I took were not as crowded as they normally are in the summer, said Zeringer. We started at a restored saloon inside the Pioneer Building, where she did a brief introduction perched on the bar. A flight of stairs inside the building took us 15 feet below ground level. What feels like a basement now, however, used to be a lounge, and the windows you see in my sketch faced the street. We are standing just a few feet above sea level, said Zeringer. After the Great Seattle Fire, it became evident that the growing city needed proper sewage and draining systems. When the tide would go up, the toilets would explode, explained Zeringer. But the whole downtown had been built pretty much on the beach, within feet of sea level, so there was no room to dig down to install pipes. By raising the streets, however, the city gained enough room to run sewage and drainage pipes. It took me a while to understand how they actually raised the streets, but this moment on the tour did the trick. Picture yourself back in 1890. You are standing on the street sidewalk and to your right is the entrance to the Oriental Hotel. To the left is a granite retaining wall. If you were to look up above it, you’d see horse carriages and people walking at the new street level. To get in an out of the hotel, you had to climb ladders or use planks that connected the new street level with the buildings’ second floors. This underground level where I stood to sketch the scene was later covered up. Skylights like the one you see on my first sketch were used to provide illumination, but you can imagine what a shady place the undeground became! Eventually, a bubonic plague forced all business activity in the underground to stop, said Zeringer. We entered the second segment of the tour through this stairway on First Avenue. As I sketched the view later, a new tour group showed up and I was able to catch the figure of the last person going down the stairs. Throughout the tour, you can see rubble from the 1949 earthquake that has been shoveled to the side. In this sketch, Zeringer points her flashlight to a historic picture of the area where we are standing. A general store used to be further down the corridor, and the space is now used as a wedding hall. Back on ground level after about 90 minutes, Zeringer pointed to the same skylight we had looked up to from below. You’ll recognize the location as the corner of Yesler Way and 1st Avenue South. After almost seven years living here, I’m glad I finally took the tour. Can you think of another good Seattle attraction to explore on a rainy day? What has drawn your attention around Seattle lately? Send me your suggestions of interesting places and people to sketch via e-mail, Facebook or Twitter.